If you live in New York City and have skills in healthcare, sales or education, there are lots of opportunities for you. Conversely, if you have investment skills - like trading and investment, general finance and corporate finance - you better have a spectacular profile. Because there are a lot of people to compete against. That’s just one of the findings of LinkedIn’s February 2017 Workforce Report, where we looked at the skill gaps, hiring trends and talent migrations throughout the United States. From our report, which is based off exclusive LinkedIn data, you can see where people are moving, the most in-demand skills in specific cities and what cities and industries are hiring the most. For New York City in particular, we looked at its most abundant skills. Living up to its name as the financial capital of the world, we found that there was a surplus of people with investment skills in the city. 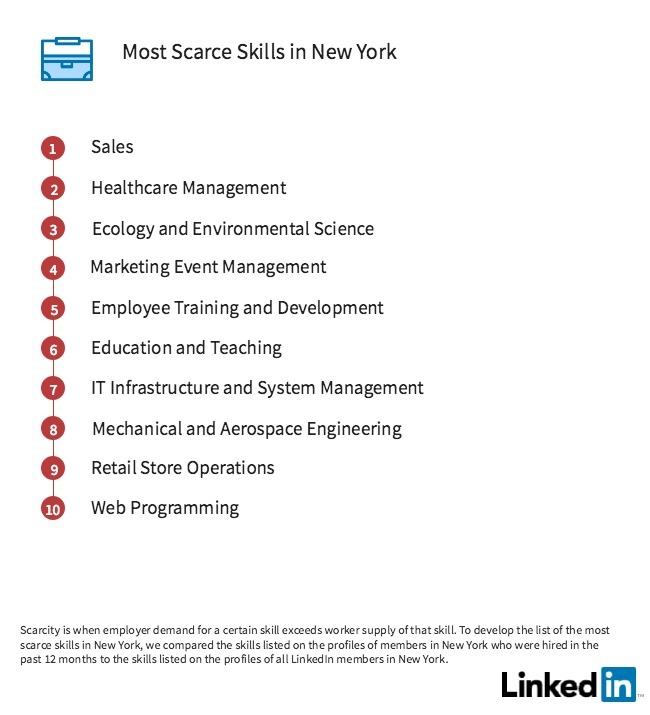 Conversely, we also looked at the scarcest – aka the most in-demand – skills in the city. 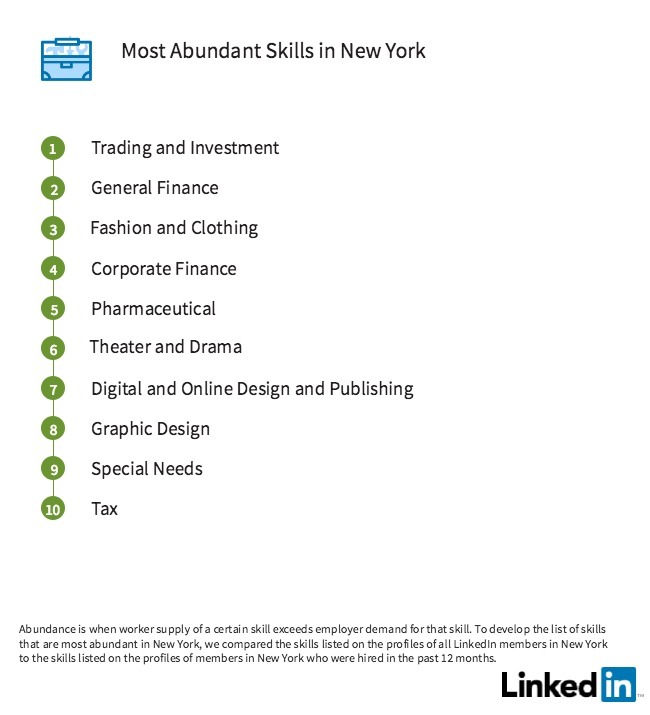 This means few people in New York City have these skills, compared to the demand there is for them. If you don’t have these skills, check out New York’s City Report. It includes LinkedIn Learning courses you can take to learn them and become more attractive to recruiters. Overall though, New York City’s economy remains strong, with an 8 percent increase in hiring in January, compared to January 2016. 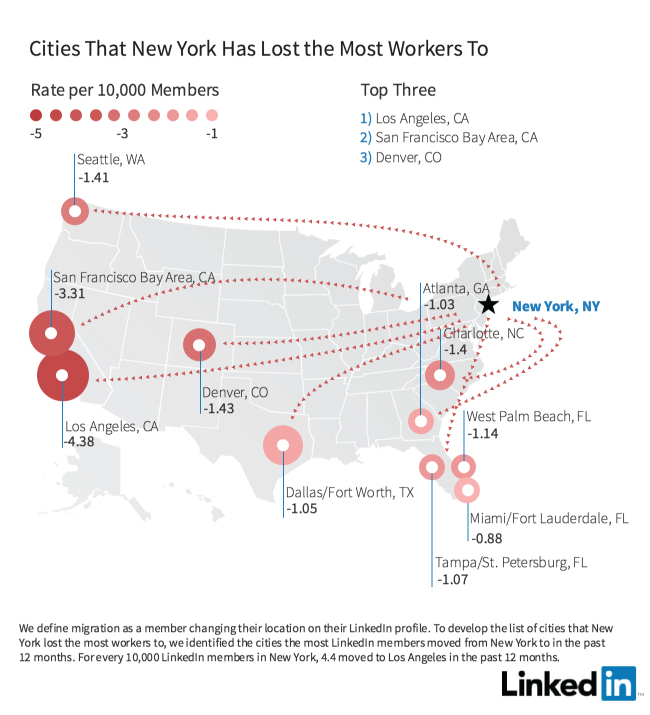 Bottom line, if you are in sales or healthcare, New York City is a good place to look for work. Conversely, if you work in finance, it’s very competitive. Click here to see the February 2017 Workforce Learning Report for the United States. Or, check out LinkedIn Learning to learn in-demand skills that’ll make you more attractive to employers.